Dews Coaches is operating South Cambridgeshire’s new BikeBus Explorer service. Launched recently, with the first run taking place on 27 July, South Cambridgeshire District Council describes it as unique, with the bus pulling a bike trailer behind for passengers’ bikes. The new service is a first in Cambridgeshire although similar services operate in a handful of UK destinations, including the Brecon Beacons. Chris Peat attended the launch at Wimpole Hall, a picturesque stately home easily accessible via the new bus service. Running on Sundays and Bank Holidays, BikeBus Explorer has a PVR of one bus, a TransBus Pointer Dart with a capacity for 34 passengers. 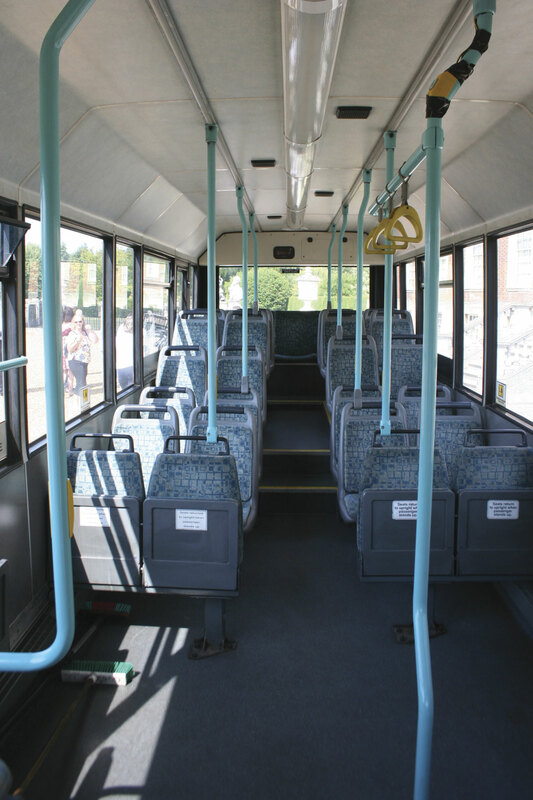 On the other six days of the week, it is used on the operator’s 106 service from Haddenham to Ely. There are two variations to the BikeBus route. The ‘A’ variant starts at Cambridge railway station, running to the villages of Barton, Orwell, the Wimpole Estate, Arrington, Croydon, Hatley St George and Gamlingay. The ‘B’ begins at Gamlingay, then serves Waresley, Great Gransden, Longstowe, Arrington, the Wimpole Estate, Orwell, Barton and in to Cambridge. There are four runs a day on each circular route, taking in a host of visitor attractions along the way. It is ideally suited to cyclists as it serves a number of beauty spots and runs past idyllic countryside and ancient woods. As well as cyclists, it offers a local service for residents on the days it operates. Tickets can be purchased when boarding the bus and they allow riders to hop on and off all day using their bikes for other parts of their journey. They can also be bought at the Cambridge Tourist Information Centre in the Guildhall. National Trust is promoting the service and further promotion will be carried out by the Information Centre. Funding for the route comes from the District Council, Cambridgeshire County Council and the National Trust. Money from the Local Sustainable Transport Fund has been used to support it. 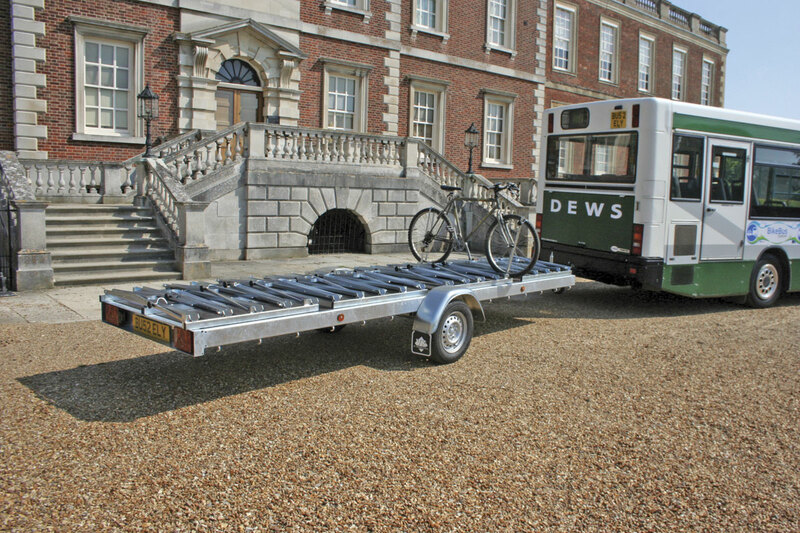 Simon said the National Trust bought the trailer for the bus. The trailer is from Dutch firm, VK International. 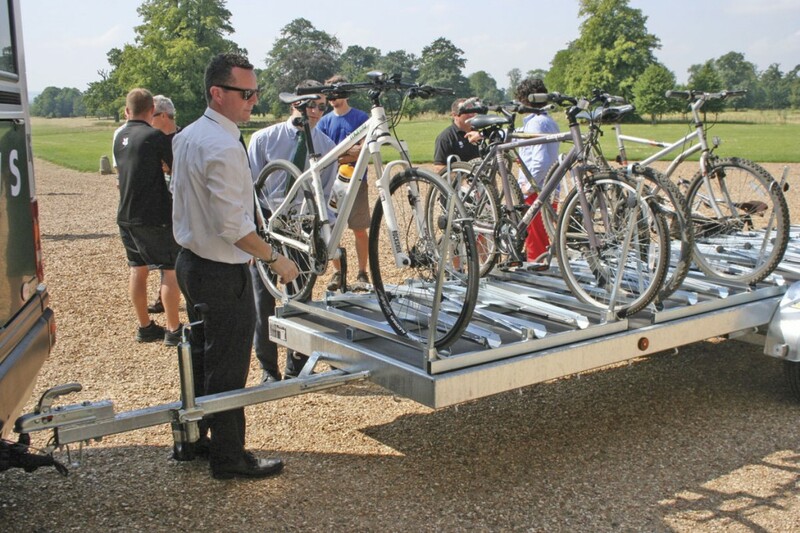 MD of Dews, Simon Dew, said cycles are easy to fit and remove from the trailer. This sort of equipment is widely used in the bike friendly Netherlands, according to Simon, with the equipment being sold across Europe. He said it was easy to fix onto the vehicle and believes it is the first one in the UK. Up to 20 bikes can be loaded onto the back of it, with Simon remarking how straightforward it is to fix them into place on it. Drivers were given training with the trailer, which Simon said has gone well. A trailer licence is needed to be able to drive on this service, with the operator putting its drivers through it. There are grandfather rights associated with trailer licences, but no one at Dews enjoyed these rights. He said it would certainly improve the economy in the locality of the route, providing more custom for the area’s businesses. He also believes it will have the effect of reducing the number of cars on the road and improve connections for local residents. Fares for the service range from £4 to £5 for an adult return, or £2.20 to £2.70 for a single. An Adult Day Explorer, which can be used on the whole of the network all day, costs £5. Adult bike carriage is £2 or £1 for kids. Cllr Edwards described the fares as priced ‘sensibly’. Visit www.scambs.gov.uk/bikebus-explorer for further information on the service, cycle routes and attractions.